Vector frame fabric banners combine aluminum extrusion frames with push to fit fabric graphics to create a versatile banner, backwall, hanging art or display. Frame banners ca be used to display messaging or art in a corporate environment or at a tradeshow and feature a 2” aluminum extrusion frame, single or double sided graphics, and backlit options. The Vector Frame series is a collection of geometric shaped backwalls, banners, exhibit kits, counters and light boxes that feature durable, easy-to-assemble aluminum extrusion frames and push to fit graphics. The vector frame can be reconfigured and customized to create a completely tailored exhibit. The Hybrid Pro Modular series is a collection of modular and reconfigurable exhibit backwall and counters that feature heavy duty aluminum frames, push-fit fabric graphics and high-end features such as tables, monitor mounts, interior LED lighting and more. The intricacy of the details makes these exhibits impossible not to notice. 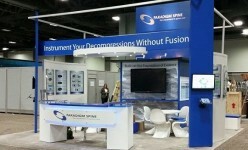 Versatile inline 10’x 20′ exhibits can be reconfigured for 10’x10′ displays, increasing the value and lifecycle of the exhibits as well as the investment. Attract visitors and broadcast your brand atop the tall fabric tower structure of this exhibit. Hybrid Pro Modular Kit 17 features a variety of bells and whistles that make the structure perfect for engagement and demonstrations. Stylish aluminum hardware is combined with white laminate panels, printed rigid graphics and stretch fabric graphics to create a presence on the show floor that will absolutely turn heads. Wow your clients with this modern island structure that features state-of-the-art printed fabric graphics. Hybrid Pro Modular Kit 18 features an 11’ 10” tall square shaped structure that comes with a number of features that dress and accessorize. Sleek aluminum hardware is combined with double sided push-fit fabric graphics to inform visitors of your desired brand and message. The optional front reception counter and the interior counter provide accessible and lockable storage. Rise above the competition with tall fabric graphic towers. Mounted monitors, accent lighting, and open floor plan and semi-private meeting areas are some of the highlights of this dynamic display. Hybrid Pro # 19 feature four commanding walls that stand 15’9” tall with double sided push to fit fabric graphics 8’ square, helping to make your brand and message stand higher than the rest! Dominate the tradeshow floor with the buttress-style exhibit, featuring curve corner heavy duty white laminated wood structures, fabric graphic walls, accents, and an open center area perfect for meetings and seating. Hybrid Pro Kit 20 stands approximately 14’ tall and features over eight areas to display messaging, media, or products.